Back in the day, growing your email list wasn't an essential business task. 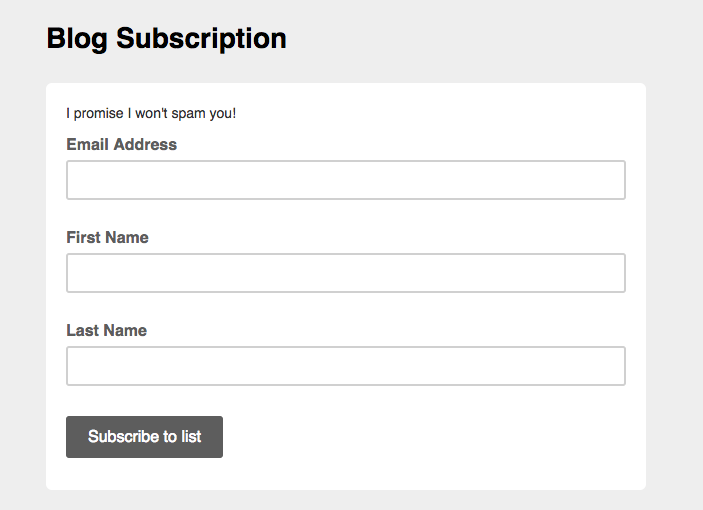 All you did was slap a sign up form on your site and people either signed up for your list, or they didn't. Either way, you didn't really care. Why? Because email marketing wasn't a critical component of your strategy. But these days, with social media algorithms changing left and right, it becomes painfully apparent that growing your email list is one of the most critical ways to ensure that your business will be around for the long haul. Remember when MySpace went under? Lots of businesses failed then. And now with what people are calling the Facebook Apocalypse, many bloggers who relied in large part on their business pages to get in front of their target audience are about to face a serious struggle. It's a war out there. And everyone is in there fighting. But you know who's going to win the fight? The ones with the email list. Your email list is yours. No matter what the social media gods throw your way, your email list will always be there. So if Facebook collapses tomorrow and you lose your following of tens of thousands of people, all you need to do is email your list. Your email list means that you'll still have a business, no matter what. Well - that's an easy question. You grow your list. Plain and simple. You put everything you have into growing that list from the ground up - and you never, ever stop. Feeling stressed about it? No worries, I'm here to make that easy. Time and time again, I peruse the web and see people’s sites featuring subscription boxes that say something like “sign up to receiver a newsletter in your inbox each week”. Headsmack. PLEASE avoid doing that! Besides the few dozen subscribers (mostly friends and family) you may get at the beginning, just featuring a stale subscription box isn't sustainable. I mean seriously, do you really think people are excited to receive newsletters in their inbox? Mmmmm nope, not really. The trick to getting people to "subscribe" to your blog (rather, sign up to your email list) is to creatively entice them. A freebie is anything that you provide (for free… duh) to your readers in exchange for their email address. Both parties get something (you get an email, and your subscriber gets a fancy freebie). Everyone's happy. So, you get the point. Freebies are essential to growing your list. You really can't get anywhere without it. Now that you know WHY you need to grow your email list and WHAT you should be doing in order to make that happen, you have to ask yourself this question, "What freebie should I give to my target audience in order to get them to sign up for my email list?" This is the hard part - and it's usually where people give into their frustration and give up all together. Don't let that happen to you. We're going to work through this together. STEP ONE: WHO IS YOUR TARGET AUDIENCE? Who is your target audience? Describe their demographics (male, female, age, education level, religion, etc.) and their psychographics (personality traits, how they live their lives, etc). Understanding who your target audience is will enable you to craft the perfect marketing message to them - the sort of message that will catch their eye, hook them, and get them to listen to you. Example: your target audience may consist of male fitness fanatics between the ages of 25 - 35 who eat, sleep and breathe fitness. They want to start a gym and spread the fitness love. STEP TWO: WHAT PROBLEM/NEED DOES YOUR TARGET AUDIENCE HAVE? After you understand a bit more about your target audience, you need to figure out what they're struggling with so that you can begin to find solutions to those problems. This is the foundation for the product/service that you're going to pitch them down the line. Most bloggers try and create a product/service first and THEN figure everything else out from there. You can't do that. You can't assume need and you certainly can't assume there's a market for everything because there isn't. For best results, you must start with your target audience, figure out the need from there, and THEN create your offerings. Example: Your target audience of fitness lovers want to start a gym but they have absolutely no idea how to run a business let alone what it takes to get started. They're confused and lost - but they're hungry to make it happen. The purpose of collecting emails is to eventually build relationships with your subscribers and then direct them down various sales funnels. This means that you want your lead magnet/freebie to RELATE to your end product. Now that you know what your audience's problems are, you can start to figure out what sort of product/service to offer them. You don't even need to have your product/service offering totally created yet. You just need the vision for it so that you know where you're headed. START WITH THE END IN MIND. You have to do this. If you don't know the destination, there's no way to figure out what direction to head in. And if you're thinking to yourself, "Well, I don't want to offer a product," that's okay. You can use this same system to create a sales funnel for an affiliate product, too. Example: you want to offer your target audience with a course that will show them start to finish how to start, manage, and grow a profitable CrossFit gym. "What would someone who wants my end product/service also want for free?" This is where your freebie comes into play. Example: Let's imagine your end product is an online course that teaches people how to a highly profitable CrossFit gym. If they're willing to pay for a course on how to open a gym, then maybe a good free offer would be a A Complete Guide To All The Supplies You Need In Your CrossFit Gym - shopping list and budget breakdown. See how the freebie directly relates to the end product? Even if you don't have that online course all setup yet, by offering this freebie to your website viewers, you're growing your email list filled with people who would LOVE to buy your course when it's ready. Build that queue. Create that freebie. So by now you know a lot - why you need an email list, how to brainstorm a strategic freebie in order to build up a list of targeted potential customers. Now you need to decide what form your freebie will take. There are LOTS OF OPTIONS. People are a sucker for a nice printable. Make it something that’s worthwhile. Your readers won’t be quick to opt into a freebie that isn’t special or unique. I created blogging printables (see below) for my blog readers to download so that they can easily plan out their blog posts and weekly blog posting schedule. It’s clean, a fillable PDF, aesthetically appealing, and it’s something that would take time to create independently. You see the appeal? Checklists are surprisingly helpful if you execute them well. They help people plan, get organized, and make well-informed decisions. If you’re a blogger who blogs about web hosting, for example, you can offer an exclusive “Checklist for the perfect web host”. Since many people feel confused about web hosting and aren’t sure where to turn, a checklist that outlines the most important features of a good web host would be incredibly useful. Another example – If you blog about wedding planning, consider offering a free checklist for planning a wedding would be perfect. No bride wants to leave anything to chance when it comes to planning a wedding! There are lots of ways to incorporate checklists as freebies on your blog. And they are very simple to create, too! You can use Canva to design your checklist, and then adobe acrobat to make your PDF fillable. Think back to your school days. Workbooks helped plan and organize thoughts. They also helped you understand complex concepts as you worked through prompts step by step. Workbooks are great for adults in the same way that they’re great for young students in school. If you’re trying to help your readers understand something, develop something, or organize something, consider creating a workbook as a freebie. I saw a great example of this on Melyssa Griffin’s site. She offers a blog business plan workbook (20+ pages). It helps people who want to turn their blog into a business organize their thoughts and strategically plan for the future. Simple idea, and it’s highly useful. I’m sure that workbook got Melyssa a healthy amount of new subscribers. The great allure with ebooks is that people get the information they want delivered immediately to their inbox. No need to wait for lesson 2 of an email course to be sent tomorrow, and lesson three the day after that. Ebooks deliver the full message in one email and one ebook. 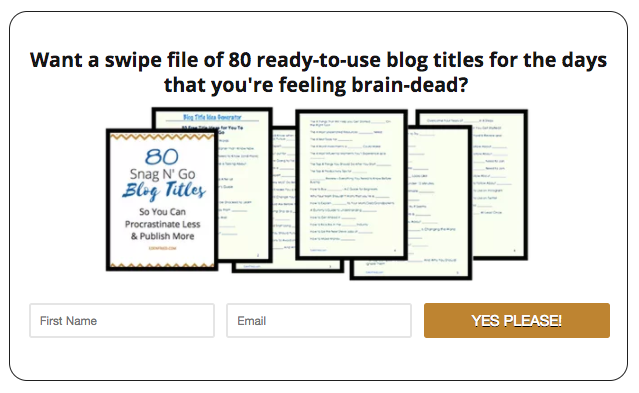 Many bloggers have a ton of success growing their email list by offering freebies. I am no exception. My list has grown exponentially since I started offering my Profitable Blogging 30 page eboo﻿﻿k, my Profitable Pinning – 4-day roadmap to profits on Pinterest and my Blogger’s Guide to Social Media Strategy ebook/workbook. Here’s the thing with ebooks: you don’t want them to disappoint. If you’re going to offer an ebook, make sure that it doesn’t over promise and under deliver. Give your readers the free value they deserve. I’ve seen a lot of ebooks that totally disappointed. Your readers will remember how they felt after checking out your ebooks. You want them to remember that it was EXCELLENT not disappointing (as with anything you deliver to them, of course). No need to get fancy when creating your ebooks. Typically, I design the covers in canva and write the content in Microsoft Word. I have also experimented with creating an entire ebook in Canva, but it got glitch after about the 10th page. So I’ll steer clear of that again in the future. Bet you didn’t think of offering a free consult as a freebie on your site! Well, you can! See how there is an infinite amount of great freebie ideas for you to offer your audience? Free consults are a great thing to offer if you’re someone who regularly provides services to customers (whether they be businesses or consumers). If you’re a Pinterest Virtual Assistant, you can offer a 25-minute free consult to a brand new Pinterest user. If you’re a web designer, you can analyze your subscriber’s websites in a quick 30-minute session. Free consults can be useful because they give you a direct line of communication with subscribers, allowing you to form a relationship and build trust. People who you’ve spoken with directly are more likely to buy your products or hire you for your services if they feel like they know you. That said, free consults can eat up a lot of your time. You might want to choose another type of freebie, if your schedule is already jam-packed. Whether you sell products or services, you can offer your readership a coupon. In order to access the coupon code, however, they’ll need to submit their email address to you. If your readers are interested in your services anyway, coupons are a nice way to seal the deal and close in on new sales. Are you a font designer (stylist?) or graphic designer? People go NUTS over this sort of free stuff, since usually they come at a steep price when you shop elsewhere. Even if you're not a designer/stylist/photographer, you can still offer this stuff for free on your site. You can always hire someone to create it for you - just make sure you retain the rights to it! If you have an eye for creating styled stock photos and a decent camera handy, you might want to consider creating your own styled stock photos and offering a few for free on your site. This works especially well if you run a stock photo membership website. Offering free photos is a great way to get a reader’s email address and an even better way to nurture them down your sales funnel. MomsMakeCents.com is a great example of a site that offers free styled stock photos ​to entice people to subscribe! When I first started my blog, I wrote a lot about my freelance journey. So, the first freebie I created was a 5-day email course that taught students how to earn their first $1000 as an online freelancer. Granted, I didn’t have a ton of traffic, but my email course conversion rate was very high. People LOVE to sign up for courses. For some reason, they sound incredibly appealing. Free lessons delivered to your inbox? Hell yeah! Email courses are extremely popular, but self-paced courses make for an amazing freebie. Why? Because everyone digests information differently. Some people love to have only one lesson delivered to their inbox each day while other people wish they could breeze through the entire course all at once. My friend Meera Kothand offers an amazing free, self-paced online course to subscribers about starting a blog and getting your first 100 email subscribers. Once enrolled, subscribers get access to the entire course syllabus so they can work through it at their own pace. You can use t﻿﻿eachable (the free plan) to create a self-paced, free online course for your subscribers. I LOVE a good resource library. Essentially, a resource library is a password protected page on someone’s site that grants access to a slew of different resources. Think of it as access to dozens of freebies all rolled into one neat and tidy package. Sign up for a resource library and you suddenly have a library filled of downloadable freebies at your disposal. Resource libraries are ideal for bloggers who have been blogging long enough to have a number of freebies already created. This can be hard to execute, however, if you're struggling to think of just one freebie idea. Generally, I don't recommend this option to beginners. Many people are scared of webinars. Don’t be! Webinars are an excellent way to deliver free value to your readership and followers. If your webinar is on a topic of interest and you market it well, it can be a highly useful tool you can leverage to get tons of new subscribers. ConvertKit recently ran a campaign for a product creation masterclass – a series of webinars essentially – and 14,000 people signed up. Granted, ConvertKit is a big, well-known brand. But still, 14,000 people is a lot of people know matter how well known you are. Free information is extremely popular; so don’t underestimate the power of a webinar and how influential it can be in growing your email list! Are you a business coach or a blog coach? Are you any sort of coach? Offer a free online coaching session to your subscribers. If you want them to pay for your coaching services, you might as well give them a free trial so they can acquaint themselves with your style. Freebie coaching sessions could really increase your conversions! Remember that tutorials can be delivered in any form (ebooks, videos, email courses, etc), so there are truly an infinite number of possibilities here. Case studies are in depth examples of something. It could be anything, really. Service providers offer case studies as a testament to how their services have helped customers over time. If you’re a blogger who offers a specific service, consider taking a few positive testimonials and molding them into more formal case studies. Not only could this grow your email list, but it also could grow your sales. Your email list is everything. But you can't just *will* it to grow by closing your eyes, clicking your heels together three times and making a wish. You need to be more strategic about it all. So put on your thinking hat and brainstorm. Once that's all done - go ahead and CREATE. There's no point in putting this off. Down the line, you'll wish that you started today.